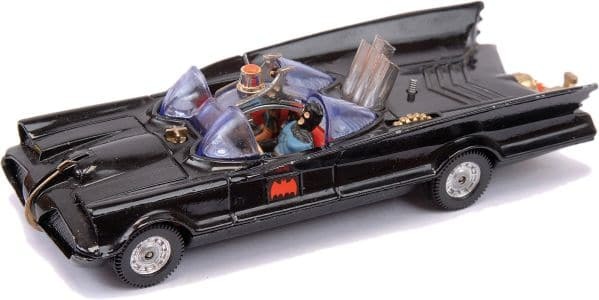 You are here: Home » MEDIA » Books » Batman Collectables by Rob Burman (book review). 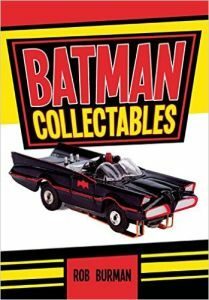 Batman Collectables by Rob Burman (book review). This ‘Batman Collectables’ by Rob Burman owes more to the 1966 version, whose DVD/blu-ray volumes came out this year than the recent films. Indeed, there is only a couple items noted from the Michael Keaton films and nothing from beyond. At least in terms of related merchandise with only a Hot Wheels large Batmobile from a couple years back included. Maybe somewhere down the line, there will be a second volume covering these films because there’s certainly been enough merchandise since. 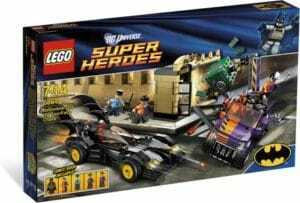 Undoubtedly, most the of the focus of this book is on the 1966 Batmobile and other vehicles the TV dynamic duo had, although you then spot the figure toys and such. 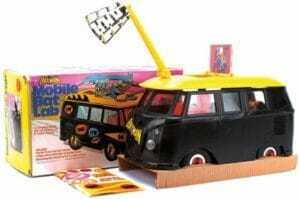 Burman gives information and a lot of photos from Vectis Auctions and a few other places showing British and American toys and licensing which doesn’t appear to be totally exclusive. Although fresh tooling was done for the cars, some companies chose to adapt existing toys they had and, as with Corgi, even changed the trim on the Bat-boat later. Consequently, there are several versions of many of these vehicles out there. Photograph from Vectis Auctions with permission. Some things struck me about the art on the various boxes. Examples by Neal Adams and a couple other DC artists of the period are easy to recognise but some of the illustrations are so poorly depicted you get the feeling that the manufacturer got someone in the mailroom to draw something than hire someone who could seriously draw. 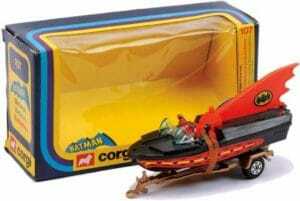 Then again, back in the 60s-70s, they probably assumed that once bought, the box would be ditched and who would care? There are some areas where I think Berman is wrong. He places the design of the Corgi Green Hornet car ‘Black Beauty (number 269)’, before the Batmobile (number 267) but as the series wasn’t introduced until mid-second season of ‘Batman’, that would have placed it a little later as the release numbers reveal. Interestingly, the demise of the bat-toys came in 1976 as the popularity of a certain ‘Star War’ film took off and created its own revolution and upped the merchandise quality. 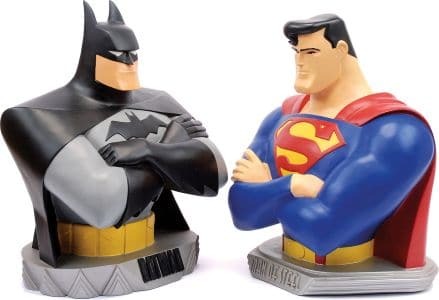 There’s mention and photos of a Woolworth’s exclusion of plastic figures of Batman and Robin but the photos don’t match the versions I bought from them around the same time. Looks like I’ll have to have to dig into one of the deeper cupboards to see if I still own them although I think I lost Robin’s detachable cloak. 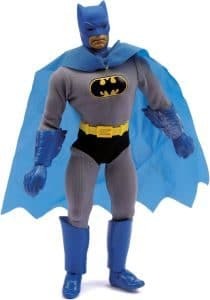 Looking at the Halloween Batman costumes with their plastic masks, I still have to wonder why they get a bat-symbol on the heads as if no one could confuse who they are with the mask eyebrows. Mind you, looking at various Bat-logos and sound effects were given for some of the vehicles, you then realise that the manufacturer bosses didn’t really get what they bought the licences for which might explain the variety of guns that had the bat-symbol on them. 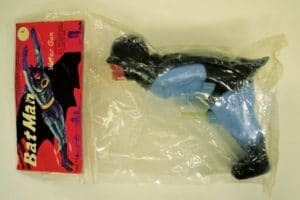 I do agree with Burman that probably the worse toy has to be the Batman water pistol, mostly for what part of his anatomy you had to press for it to shoot water. Mind you, he doesn’t indicate what part of the anatomy is used to fill the gun with water. If you collect any of the Batman toys and such, this book should be on your shelf if for no other reason than to figure out what you really want to own rather than getting some of the truly awful stuff that was produced. Burman keeps his tongue in cheek a lot of the time, making for a delightful read. For those collecting Bat-merchandise, this book will test just how much you own. « Star Wars: The Force Awakens, just let it in (trailer 2).